Ergs are flat area of desert covered with a huge volume of parallel sand dunes excavated by the aeolian activities and having little to no vegetation cover. These are normally hundreds of kilometers in length and occasionally reach heights of a hundred meters. What even today seems to be an insuperable barrier, was permeable for our ancestors during specific time periods. ‘‘Deserts have a special role in human evolution and adaptation. They appear to be the major terrestrial habitat that channeled early human dispersal, representing barriers at some times, corridors at others" (Smith et al.2005). Regarding the Paleolithic findings at the margins of the large sand seas of Libya, there must have been several pulses of settlement since the Middle Pleistocene during humid periods. The findings shown here, were made at Erg Rebiana (or Rabiana, Rabyanah), South-East Lybia, decennia ago. Geographically the Erg Rabinia belongs to the three great Sand Seas of eastern Sahara: the Egyptian Great Sand Sea, the Calanascio Sand Sea, and the Rebiana Sand Sea. The Erg Rebiana is nearer to what is today Egypt and Sudan, than other find-spots in the Libyan desert, already reviewed in this Blog (See here: 1030 , here 1751 , and here 2002 ). Anyhow, in contrast to other regions of Libya, no actual scientific expeditions on the issue of Paleolithic settlement have been undertake during the last 60 years, although a Libyan-French mission recently reported about the rich heritage of Holocene rock art in the nearby region of Kufra. A. J. Arkell reported MSA and Neolithic findings from the Kutra oasis and the Rebiana Sand Sea on behalf the British Ennedi Expedition in 1957 (see external links; page 24) . He described tanged "Aterian" MSA and, more interesting, wonderful bifacial foliates and unifacial foliated MSA points up to 17 cm long. Arkell was the first who compared the material with with Lupemban and East African artifacts. 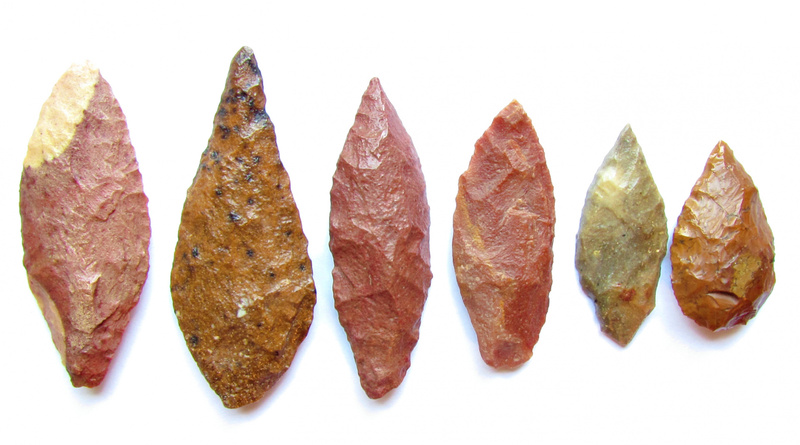 The artifacts are usually made from fine grained Quartzite covered with a thick and multicolored desert patina. 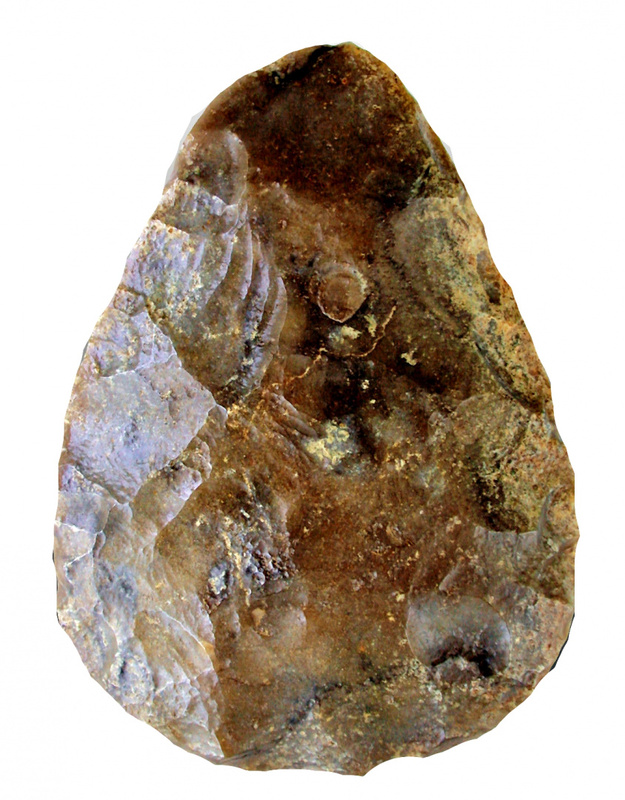 Flint is uncommon during the MSA, but known from the local Neolithic (not shown here). This is the common way of raw material procurement all over the Sahara. 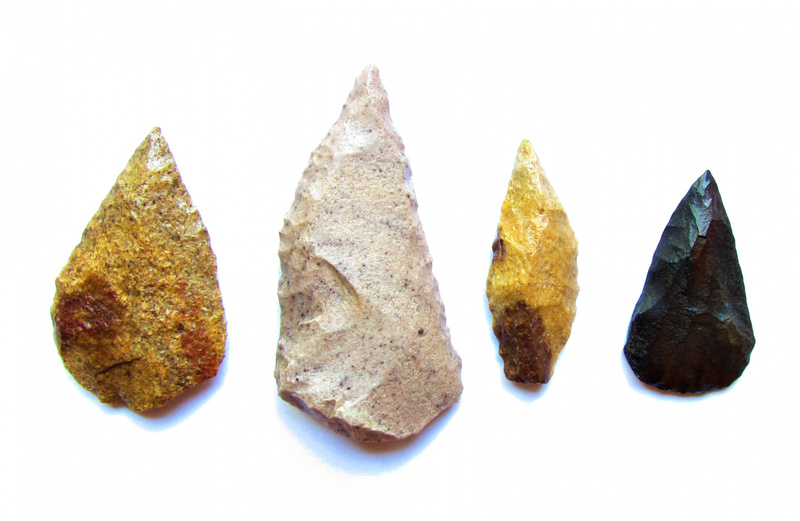 If the typologically advanced medium sized cordiform and lanceolate Bifaces (Figure 1; courteously by Werner Hernus) indicate an ESA settlement, or are part of the MSA, remains unclear. Large MSA points up to 9 cm are present. 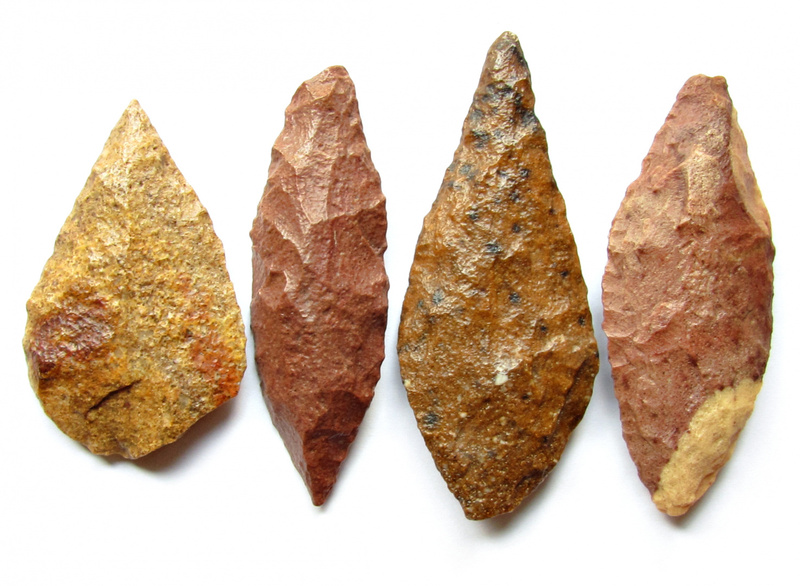 Many of these are bifacial, sometimes they have a short ("Aterian like") tang. Unifacial points (Figure 2) usually show delicate and continuous lateral retouches, which may be completely inverse. Basal thinnig by flat retouches is present in most of the pieces. Striking platforms are usually facetted. Because no cores have survived in the collection, I am unable to decide what techniques (discoid, Levallois, laminar) have been applied. MSA samples from Ubari, Murzuq and Rabiana show a unifying typo / technological trend that was diversified enough not to come under the limited "Aterian" umbrella. As Arkell already recognized, connections to Nubia, West- and East Africa are obvious. Smith, M., Veth, P., Hiscock, P., & Wallis, L. A. (2005). Global deserts in perspective. In P. Veth, M. Smith, & P. Hiscock (Eds. ), Desert peoples: Archaeological perspectives (pp. 1–13). Oxford: Blackwell.